Shop online for 19 griffon-model plastic models at discounts up to 46%. This is the 1/35 Scale SdKfz 138/1 Ausf H Grille Brass Preformed 15cm Shell Projectile Containers for a Dragon Model From Griffon Models. 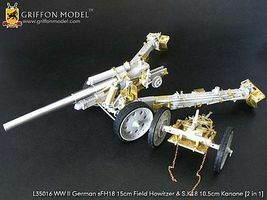 This is the 1/35 Scale sFH18 15cm Field Howitzer & sK18 10.5cm Kanone Full Detail Set (2 in 1) for a trumpeter Model From Griffon Models. 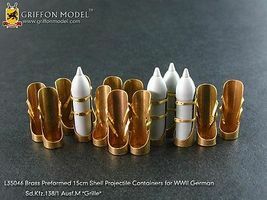 This is the 1/35 Scale 15cm Shell Projectile Containers for SdKfz 138/1 Ausf M Grille Universal Accessory from Griffon Models. 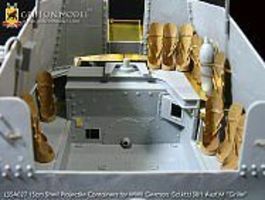 This is the 1/35 Scale SdKfz 234 Series Armored Car Vol.1 Exterior Storage Boxes for a Dragon Model From Griffon Models. This is the 1/35 Scale SdKfz 138/1 Ausf H Grille & PzKpfw 38(t) Ausf G Track Fenders for a Dragon Model From Griffon Models. 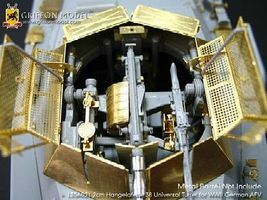 This is the 1/35 Scale AFV 2cm Hangelafette 38 Universal Turret Detail Set for a Dragon Model From Griffon Models. 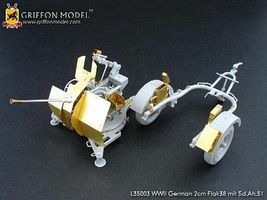 This is the 1/35 Scale 2cm Flak 38 with SdAh51 Full Upgrade Set for a Dragon Model From Griffon Models. This is the 1/35 Scale Flakpanzer 38(t) Gepard Upper Folding Armor Plate & Engine Compartment Doors for a Dragon Model From Griffon Models. 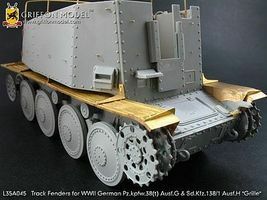 This is the 1/35 Scale SdKfz 140/Sdkfz 138 Ausf M Series Chassis Universal Track Fenders Detail Set from Griffon Models. This is the 1/35 Scale Flakpanzer 38(t) Gepard Fenders & Late Version Flak 38 Gun Detail Set w/Resin Parts from Griffon Models. This is the 1/35 Scale SdKfz 138/1 Ausf H 15cm sIG33/1 Grille Compartment Floor with Built in Stowage Detail from Griffon Models. This is the 1/35 Scale 15cm Cartridge Storage Bins for SdKfz 138/1 Ausf M Grille Universal Accessory for a Dragon Model From Griffon Models. This is the 1/35 Scale 3.7cm KwK37(t)/ UV vz38 Metal Tank Gun Barrel for a Dragon Model From Griffon Models. This is the 1/35 Scale Sdkfz 166 Brummbar Early/Mid Track Fenders for a Dragon Model From Griffon Models. 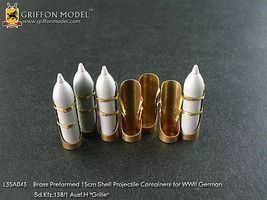 This is the 1/35 Scale 15cm sIG33 Brass Preformed 15cm Shell Cartridges for All Variants from Griffon Models. 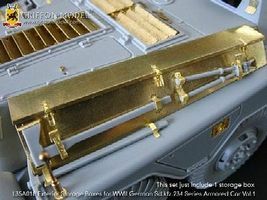 This is the 1/35 Scale SdKfz 234 Series Armored Car Vol.2 Exterior Storage Boxes for a Dragon Model From Griffon Models. This is the 1/35 Scale SdKfz 234/4 Compartment Armor Plates for a Dragon Model From Griffon Models. This is the 1/35 Scale SdKfz 138/1 Ausf H Grille 15cm Shell Cartridge Storage Bins for a Dragon Model From Griffon Models.